Multiple myeloma, also known as plasma cell myeloma, is a cancer of plasma cells, a type of white blood cell typically responsible for producing antibodies. Often, no symptoms are noticed initially. When advanced, bone pain, bleeding, frequent infections, and anemia may occur. Complications may include amyloidosis. The cause of multiple myeloma is unknown. Risk factors include obesity, radiation exposure, family history, and certain chemicals. Multiple myeloma may develop from monoclonal gammopathy of undetermined significance that progresses to smoldering multiple myeloma. The abnormal plasma cells produce abnormal antibodies which can cause kidney problems and overly thick blood. The plasma cells can also form a mass in the bone marrow or soft tissue. When only one mass is present, it is known as a plasmacytoma, while more than one is known as multiple myeloma. Multiple myeloma is diagnosed based on blood or urine tests finding abnormal antibodies, bone marrow biopsy finding cancerous plasma cells, and medical imaging finding bone lesions. Another common finding is high blood calcium levels. Globally, multiple myeloma affected 488,000 people and resulted in 101,100 deaths in 2015. In the United States, it develops in 6.5 per 100,000 people per year and 0.7% of people are affected at some point in their lives. It usually occurs around the age of 61 and is more common in men than women. It is uncommon before the age of 40. Without treatment, typical survival is seven months. With current treatments, survival is usually 4–5 years. This gives a five-year survival rate around 49%. The word myeloma is from the Greek myelo- meaning "marrow" and -oma meaning "tumor". Because many organs can be affected by myeloma, the symptoms and signs vary greatly. A mnemonic sometimes used to remember some of the common symptoms of multiple myeloma is CRAB: C = calcium (elevated), R = renal failure, A = anemia, B = bone lesions. Myeloma has many other possible symptoms, including opportunistic infections (e.g., pneumonia) and weight loss. 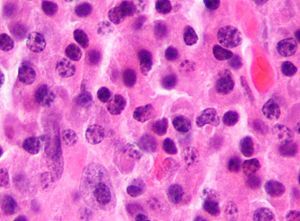 CRAB symptoms and proliferation of monoclonal plasma cells in the bone marrow are part of the diagnostic criteria of multiple myeloma. Bone pain affects almost 70% of patients and is the most common symptom. Myeloma bone pain usually involves the spine and ribs, and worsens with activity. Persistent localized pain may indicate a pathological bone fracture. Involvement of the vertebrae may lead to spinal cord compression or kyphosis. Myeloma bone disease is due to the overexpression of receptor activator for nuclear factor κ B ligand (RANKL) by bone marrow stroma. RANKL activates osteoclasts, which resorb bone. The resultant bone lesions are lytic (cause breakdown) in nature, and are best seen in plain radiographs, which may show "punched-out" resorptive lesions (including the "raindrop" appearance of the skull on radiography). The breakdown of bone also leads to the release of calcium into the blood, leading to hypercalcemia and its associated symptoms. Myeloma cells producing monoclonal proteins of varying types. The most common cause of kidney failure in multiple myeloma is due to proteins secreted by the malignant cells. Myeloma cells produce monoclonal proteins of varying types, most commonly immunoglobulins (antibodies) and free light chains, resulting in abnormally high levels of these proteins in the blood. Depending on the size of these proteins, they may be excreted through the kidneys. Kidneys can be damaged by the effects of proteins or light chains. Increased bone resorption leads to hypercalcemia and causes nephrocalcinosis, thereby contributing to the kidney failure. Amyloidosis is a distant third in the causation. Patients with amyloidosis have high levels of amyloid protein that can be excreted through the kidneys and cause damage to the kidneys and other organs. Some symptoms (e.g., weakness, confusion, and fatigue) may be due to anemia or hypercalcemia. Headache, visual changes, and retinopathy may be the result of hyperviscosity of the blood depending on the properties of the paraprotein. Finally, radicular pain, loss of bowel or bladder control (due to involvement of spinal cord leading to cord compression) or carpal tunnel syndrome, and other neuropathies (due to infiltration of peripheral nerves by amyloid) may occur. It may give rise to paraplegia in late-presenting cases. The cause is generally unknown. Smoldering multiple myeloma increases the risk of developing multiple myeloma. Individuals diagnosed with this premalignant disorder develop multiple myeloma at a rate of 10% per year for the first 5 years, 3% per year for the next 5 years, and then 1% per year. A familial predisposition to myeloma exists. Hyperphosphorylation of a number of proteins—the paratarg proteins—a tendency which is inherited in an autosomal dominant manner, appears a common mechanism in these families. This tendency is more common in African-American patients with myeloma and may contribute to the higher rates of myeloma in this group. Rarely, Epstein-Barr virus (EBV) is associated with multiple myeloma, particularly in individuals who have an immunodeficiency due to e.g. HIV/AIDS, organ transplantation, or a chronic inflammatory condition such as rheumatoid arthritis. EBV-positive multiple myeloma is classified by the World Health Organization (2016) as one form of the Epstein-Barr virus-associated lymphoproliferative diseases and termed Epstein-Barr virus-associated plasma cell myeloma. EBV-positive disease is more common in the plasmacytoma rather than multiple myeloma form of plasma cell cancer. Tissues involved in EBV+ disease typically show foci of EBV+ cells with the appearance of rapidly proliferating immature or poorly differentiated plasma cells. The cells express products of EBV genes such as EBER1 and EBER2. While the EBV contributes to the development and/or progression of most Epstein-Barr virus-associated lymphoproliferatve diseases, its role in multiple myeloma is not known. However, EBV-positive patients with localized plasmacytoma(s) are more likely to progress to multiple myeloma compared to patients with EBV-negative plasmacytoma(s). This suggest that EBV may have a role in the progression of plasmacytomas to systemic multiple myeloma. A chromosomal translocation between the immunoglobulin heavy chain gene (on chromosome 14, locus q32) and an oncogene (often 11q13, 4p16.3, 6p21, 16q23 and 20q11) is frequently observed in patients with multiple myeloma. This mutation results in dysregulation of the oncogene which is thought to be an important initiating event in the pathogenesis of myeloma. The result is a proliferation of a plasma cell clone and genomic instability that leads to further mutations and translocations. The chromosome 14 abnormality is observed in about 50% of all cases of myeloma. Deletion of (parts of) chromosome 13 is also observed in about 50% of cases. Production of cytokines (especially IL-6) by the plasma cells causes much of their localised damage, such as osteoporosis, and creates a microenvironment in which the malignant cells thrive. Angiogenesis (the generation of new blood vessels) is increased. The produced antibodies are deposited in various organs, leading to kidney failure, polyneuropathy, and various other myeloma-associated symptoms. In a study that investigated the DNA methylation profile of multiple myeloma cells and normal plasma cells, a gradual demethylation from stem cells to plasma cells was observed. The observed methylation pattern of CpG within intronic regions with enhancer-related chromatin marks in multiple myeloma is similar to undifferentiated precursor and stem cells. These results may represent a de novo epigenetic reprogramming in multiple myeloma, leading to the acquisition of a methylation pattern related to stemness. Mutations in a number of genes have been associated with this condition. These include ATM, BRAF, CCND1, DIS3, FAM46C, KRAS, NRAS and TP53. The genetic and epigenetic changes occur progressively. The initial change, often involving one chromosome 14 translocation, establishes a clone of bone marrow plasma cells that causes the asymptomatic disorder monoclonal gammopathy of undetermined significance (MGUS). MGUS is a premalignant disorder characterized by increased numbers of plasma cells in the bone marrow or the circulation of a myeloma protein immunoglobulin. Further genetic or epigenic changes produce a new clone of bone marrow plasma cells, usually descendant from the original clone, that causes the more serious but still asymptomatic premalignant disorder smoldering multiple myeloma. Smoldering multiple myeloma is characterized by a rise in the number of bone marrow plasma cells or levels of the circulating myeloma protein above that seen in MGUS. Subsequent genetic and epigenetic changes lead to a new, more aggressive clone of plasma cells which cause further rises in the level of the circulating myeloma protein, further rises in the number of bone marrow plasma cells, or the development of one or more of a specific set of "CRAB" symptoms which are the basis for diagnosing malignant multiple myeloma and treating the disease. Being asymptomatic, monoclonal gammapathy of undetermined significance and smoldering multiple myeloma are typically diagnosed fortuitously by detecting a myeloma protein on serum protein electrophoresis tests done for other purposes. Monoclonal gammopathy of undetermined significance is a relatively stable condition afflicting 3% of people aged 50 and 5% of people aged 70; it progresses to multiple myeloma at a rate of 0.5-1% cases per year; smoldering multiple myeloma does so at a rate of 10% per year for the first 5 years but then falls off sharply to 3% per year for the next 5 years and thereafter to 1% per year. Overall, some 2-4% of multiple myeloma cases eventually progress to plasma cell leukemia. The presence of unexplained anemia, kidney dysfunction, a high erythrocyte sedimentation rate (ESR), lytic bone lesions, elevated beta-2 microglobulin, or a high serum protein (especially raised globulins or immunoglobulin) may prompt further testing. The globulin level may be normal in established disease. A doctor will request protein electrophoresis of the blood and urine, which might show the presence of a paraprotein (monoclonal protein, or M protein) band, with or without reduction of the other (normal) immunoglobulins (known as immune paresis). One type of paraprotein is the Bence Jones protein which is a urinary paraprotein composed of free light chains (see below). Quantitative measurements of the paraprotein are necessary to establish a diagnosis and to monitor the disease. The paraprotein is an abnormal immunoglobulin produced by the tumor clone. Other useful laboratory tests include quantitative measurement of IgA, IgG, IgM (immunoglobulins) to look for immune paresis, and beta-2 microglobulin which provides prognostic information. On peripheral blood smear, the rouleaux formation of red blood cells is commonly seen, though this is not specific. A bone marrow biopsy is usually performed to estimate the percentage of bone marrow occupied by plasma cells. This percentage is used in the diagnostic criteria for myeloma. Immunohistochemistry (staining particular cell types using antibodies against surface proteins) can detect plasma cells which express immunoglobulin in the cytoplasm and occasionally on the cell surface; myeloma cells are often CD56, CD38, CD138, CD319 positive and CD19, CD20 and CD45 negative. Flow cytometry is often used to establish the clonal nature of the plasma cells, which will generally express only kappa or lambda light chain. Cytogenetics may also be performed in myeloma for prognostic purposes, including a myeloma-specific FISH and virtual karyotype. Bizarre cells, which are multinucleated. Flame cells, having a fiery red cytoplasm. Historically, the CD138 has been used to isolate myeloma cells for diagnostic purposes. However, this antigen disappears rapidly ex vivo. Recently, however, it was discovered that the surface antigen CD319 (SLAMF7) is considerably more stable and allows robust isolation of malignant plasma cells from delayed or even cryopreserved samples. The prognosis varies widely depending upon various risk factors. The Mayo Clinic has developed a risk-stratification model termed Mayo Stratification for Myeloma and Risk-adapted Therapy (mSMART) which divides people into high-risk and standard-risk categories. People with deletion of chromosome 13 or hypodiploidy by conventional cytogenetics, t(4;14), t(14;16), t(14;20) or 17p- by molecular genetic studies, or with a high plasma cell labeling index (3% or more) are considered to have high-risk myeloma. The diagnostic examination of a person with suspected multiple myeloma typically includes a skeletal survey. This is a series of X-rays of the skull, axial skeleton and proximal long bones. Myeloma activity sometimes appears as "lytic lesions" (with local disappearance of normal bone due to resorption), and on the skull X-ray as "punched-out lesions" (pepper pot skull). Lesions may also be sclerotic which is seen as radiodense. Overall, the radiodensity of myeloma is between −30 and 120 Hounsfield units (HU). Magnetic resonance imaging (MRI) is more sensitive than simple X-ray in the detection of lytic lesions, and may supersede skeletal survey, especially when vertebral disease is suspected. Occasionally a CT scan is performed to measure the size of soft tissue plasmacytomas. Bone scans are typically not of any additional value in the workup of myeloma patients (no new bone formation; lytic lesions not well visualized on bone scan). X-ray of the forearm, with lytic lesions. A CT of the brain revealed a lytic lesion in the left temporal bone (right side of image), and petrous temporal bones involving the mastoid segment of the facial nerve canal. Red arrows: lesion; green arrow: normal contralateral facial nerve canal. The lesions are consistent with a myeloma deposit. CT scan of the lower vertebral column in a man with multiple myeloma, showing multiple osteoblastic lesions. These are more radiodense (brighter in this image) than the surrounding cancellous bone, in contrast to osteolytic lesions which are less radiodense. Femur with multiple myeloma lesions. Humerus with multiple myeloma lesions. Note: Recurrent infections alone in a patient who has none of the CRAB features is not sufficient to make the diagnosis of myeloma. Patients who lack CRAB features but have evidence of amyloidosis should be considered as amyloidosis and not myeloma. CRAB-like abnormalities are common with numerous diseases, and it is imperative that these abnormalities are felt to be directly attributable to the related plasma cell disorder and every attempt made to rule out other underlying causes of anemia, kidney failure, etc. In 2014, the IMWG updated their criteria further to include biomarkers of malignancy. These biomarkers are >60% clonal plasma cells, a serum involved / uninvolved free light chain ratio ≥ 100 (the concentration of the involved free light chain must be ≥ 100 mg/L) and more than one focal lesion ≥ 5 mm by MRI. Together these biomarkers and the CRAB criteria are known as Myeloma Defining Events. A patient must have >10 % clonal plasma cells and any Myeloma Defining Event in order to be diagnosed with myeloma. The biomarker criteria were added so that smouldering multiple myeloma patients at high risk of developing multiple myeloma could be diagnosed before organ damage occurred and so they would therefore have a better prognosis. Related conditions include solitary plasmacytoma (a single tumor of plasma cells, typically treated with irradiation), plasma cell dyscrasia (where only the antibodies produce symptoms, e.g., AL amyloidosis), and peripheral neuropathy, organomegaly, endocrinopathy, monoclonal plasma cell disorder, and skin changes. Note that the ISS should be used only in patients who meet diagnostic criteria for myeloma. Patients with MGUS and asymptomatic myeloma who have kidney dysfunction from unrelated causes such as diabetes or hypertension may have elevated β2M levels from the kidney dysfunction and cannot be considered as stage III myeloma. This is one of the limitations of the ISS. It does not really quantify tumor burden or extent unlike staging systems used in other cancers. It is more of a prognostic index rather than a true staging system. For this reason, it is recommended that the ISS be used along with the Durie–Salmon Staging System (see below). First published in 1975, the Durie–Salmon staging system is still in use. However, one of the limitations of the Durie–Salmon staging system is the subjectivity in determining the extent of bone disease. The risk of multiple myeloma can be reduced by maintaining a normal body weight. In addition to direct treatment of the plasma cell proliferation, bisphosphonates (e.g., pamidronate or zoledronic acid) are routinely administered to prevent fractures; they have also been observed to have a direct anti-tumor effect even in patients without known skeletal disease. If needed, red blood cell transfusions or erythropoietin can be used for management of anemia. Initial treatment of multiple myeloma depends on the patient’s age and other illnesses present. The preferred treatment for those under the age of 65 is high-dose chemotherapy, commonly with bortezomib based regimens, and lenalidomide–dexamethasone. This is followed by autologous hematopoietic stem-cell transplantation (ASCT) – the transplantation of a patient’s own stem cells. It is not curative, but does prolong overall survival and complete remission. Allogeneic stem cell transplantation, the transplantation of a healthy person’s stem cells into the affected patient, has the potential for a cure, but is used in a very small percentage of patients (and in the relapsed setting, not as part of initial treatment). Furthermore, there is a 5–10% treatment-associated mortality rate associated with allogeneic stem cell transplant. People over age 65 and people with significant concurrent illness often cannot tolerate stem cell transplantation. For these patients, the standard of care has been chemotherapy with melphalan and prednisone. Recent studies among this population suggest improved outcomes with new chemotherapy regimens, e.g., with bortezomib. Treatment with bortezomib, melphalan, and prednisone had an estimated overall survival of 83% at 30 months, lenalidomide plus low-dose dexamethasone an 82% survival at 2 years and melphalan, prednisone and lenalidomide had a 90% survival at 2 years. Head-to-head studies comparing these regimens have not been performed as of 2008[update]. Most people, including those treated with ASCT, will relapse after initial treatment. Maintenance therapy using a prolonged course of low toxicity medications is often used to prevent relapse. A 2017 meta-analysis showed that post ASCT maintenance therapy with lenalidomide improved progression free survival and overall survival in people at standard risk. A 2012 clinical trial showed that people with intermediate and high risk disease benefit from a bortezomib based maintenance regimen. The natural history of myeloma is of relapse following treatment. This may be attributed to tumor heterogeneity. Depending on the patient's condition, the prior treatment modalities used and the duration of remission, options for relapsed disease include re-treatment with the original agent, use of other agents (such as melphalan, cyclophosphamide, thalidomide or dexamethasone, alone or in combination), and a second autologous stem cell transplant. daratumumab — a monoclonal antibody against CD38 indicated for the treatment of patients with multiple myeloma who have received at least three prior lines of therapy including a proteasome inhibitor and an immunomodulatory agent or who are double refractory to a proteasome inhibitor and an immunomodulatory agent. The prognoses for patients with multiple myeloma, as those with other diseases, are not the same for everyone. The average age of onset is 70 years. Older patients are often experiencing other serious diseases, which affect survival. Younger patients might have much longer survival rates. Globally, multiple myeloma affected 488,000 people and resulted in 101,100 deaths in 2015. This is up from 49,000 in 1990. In the United States in 2016, there were an estimated 30,330 new cases and 12,650 deaths. These numbers are based on assumptions made using data from 2011, which estimated the prevalence as 83,367 people, the incidence as 6.1 per 100,000 people per year, and the mortality as 3.4 per 100,000 people per year. Multiple myeloma is the second most prevalent blood cancer (10%) after non-Hodgkin's lymphoma. It represents approximately 1.8% of all new cancers and 2.1% of all cancer deaths. Multiple myeloma affects slightly more men than women. African Americans and Native Pacific Islanders have the highest reported incidence of this disease in the United States and Asians the lowest. Results of a recent study found the incidence of myeloma to be 9.5 cases per 100,000 African Americans and 4.1 cases per 100,000 Caucasian Americans. Among African Americans, myeloma is one of the top 10 causes of cancer death. Myeloma is the 17th most common cancer in the UK (around 4,800 people were diagnosed with the disease in 2011), and it is the 16th most common cause of cancer death (around 2,700 people died of it in 2012). The alternative name Kahler's disease is after Otto Kahler. In dogs, multiple myeloma accounts for around 8% of all haemopoietic tumors. Multiple myeloma occurs in older dogs, and is not particularly associated with either males or females. No breeds appear overrepresented in case reviews that have been conducted. Diagnosis in dogs is usually delayed due to the initial non specificity and range of clinical signs possible. Diagnosis usually involves bone marrow studies, X-rays, and plasma protein studies. In dogs, protein studies usually reveal the monoclonal gammaglobulin elevation to be IgA or IgG in equal incidence. In rare cases the globulin elevation is IgM, which is referred to as Waldenström's macroglobulinemia. The prognosis for initial control and return to good quality of life in dogs is good. 43% of dogs started on a combination chemotherapeutic protocol achieved complete remission. Long-term survival is normal, with a median of 540 days reported. The disease eventually recurs, becoming resistant to available therapies. The complications of kidney failure, sepsis, or pain can lead to an animal's death, frequently by euthanasia. ^ a b c d e f g "Plasma Cell Neoplasms (Including Multiple Myeloma)—Patient Version". NCI. 1980-01-01. Archived from the original on 27 July 2016. Retrieved 8 August 2016. ^ a b c d e f g h i "Plasma Cell Neoplasms (Including Multiple Myeloma) Treatment (PDQ®)–Health Professional Version". NCI. July 29, 2016. Archived from the original on 4 July 2016. Retrieved 8 August 2016. ^ a b c World Cancer Report 2014. World Health Organization. 2014. pp. Chapter 5.13. ISBN 978-9283204299. ^ a b World Cancer Report 2014. World Health Organization. 2014. pp. Chapter 2.3 and 2.6. ISBN 978-9283204299. ^ a b c d e f g h Raab MS, Podar K, Breitkreutz I, Richardson PG, Anderson KC (July 2009). "Multiple myeloma". Lancet. 374 (9686): 324–39. doi:10.1016/S0140-6736(09)60221-X. PMID 19541364. ^ a b c d e "SEER Stat Fact Sheets: Myeloma". NCI Surveillance, Epidemiology, and End Results Program. Archived from the original on 27 July 2016. Retrieved 8 August 2016. ^ "Plasma Cell Neoplasms (Including Multiple Myeloma) Treatment". National Cancer Institute. 1980-01-01. Retrieved 28 November 2017. ^ Ferri, Fred F. (2013). Ferri's Clinical Advisor 2014 E-Book: 5 Books in 1. Elsevier Health Sciences. p. 726. ISBN 978-0323084314. ^ van de Donk NW, Mutis T, Poddighe PJ, Lokhorst HM, Zweegman S (2016). "Diagnosis, risk stratification and management of monoclonal gammopathy of undetermined significance and smoldering multiple myeloma". International Journal of Laboratory Hematology. 38 Suppl 1: 110–22. doi:10.1111/ijlh.12504. PMID 27161311. ^ a b Nasr SH, Said SM, Valeri AM, Sethi S, Fidler ME, Cornell LD, Gertz MA, Dispenzieri A, Buadi FK, Vrana JA, Theis JD, Dogan A, Leung N (2013). "The diagnosis and characteristics of renal heavy-chain and heavy/light-chain amyloidosis and their comparison with renal light-chain amyloidosis". Kidney International. 83 (3): 463–70. doi:10.1038/ki.2012.414. PMID 23302715. ^ Hargreaves RM, Lea JR, Griffiths H, et al. (1995). "Immunological factors and risk of infection in plateau phase myeloma (stable phase)" (PDF). J. Clin. Pathol. 48 (3): 260–6. doi:10.1136/jcp.48.3.260. PMC 502468. PMID 7730490. Archived from the original on 2008-05-04. ^ Landgren O, Kyle RA, Pfeiffer RM, Katzmann JA, Caporaso NE, Hayes RB, Dispenzieri A, Kumar S, Clark RJ, Baris D, Hoover R, Rajkumar SV (28 May 2009). "Monoclonal gammopathy of undetermined significance (MGUS) consistently precedes multiple myeloma: a prospective study". Blood. 113 (22): 5412–7. doi:10.1182/blood-2008-12-194241. PMC 2689042. PMID 19179464. ^ a b c Dutta AK, Hewett DR, Fink JL, Grady JP, Zannettino AC (2017). "Cutting edge genomics reveal new insights into tumour development, disease progression and therapeutic impacts in multiple myeloma". British Journal of Haematology. 178 (2): 196–208. doi:10.1111/bjh.14649. PMID 28466550. ^ a b Willrich MA, Murray DL, Kyle RA (2017). "Laboratory testing for monoclonal gammopathies: Focus on monoclonal gammopathy of undetermined significance and smoldering multiple myeloma". Clinical Biochemistry. 51: 38–47. doi:10.1016/j.clinbiochem.2017.05.001. PMID 28479151. ^ Roberts, DL; Dive, C; Renehan, AG (2010). "Biological mechanisms linking obesity and cancer risk: new perspectives". Annual Review of Medicine. 61: 301–16. doi:10.1146/annurev.med.080708.082713. PMID 19824817. ^ a b Koura DT, Langston AA (August 2013). "Inherited predisposition to multiple myeloma". Therapeutic Advances in Hematology. 4 (4): 291–7. doi:10.1177/2040620713485375. PMC 3734900. PMID 23926460. ^ Sekiguchi Y, Shimada A, Ichikawa K, Wakabayashi M, Sugimoto K, Ikeda K, Sekikawa I, Tomita S, Izumi H, Nakamura N, Sawada T, Ohta Y, Komatsu N, Noguchi M (2015). "Epstein-Barr virus-positive multiple myeloma developing after immunosuppressant therapy for rheumatoid arthritis: a case report and review of literature". International Journal of Clinical and Experimental Pathology. 8 (2): 2090–102. PMC 4396324. PMID 25973110. ^ a b Rezk SA, Zhao X, Weiss LM (June 2018). "Epstein - Barr virus - associated lymphoid proliferations, a 2018 update". Human Pathology. 79: 18–41. doi:10.1016/j.humpath.2018.05.020. PMID 29885408. ^ a b Yan J, Wang J, Zhang W, Chen M, Chen J, Liu W (April 2017). "Solitary plasmacytoma associated with Epstein-Barr virus: a clinicopathologic, cytogenetic study and literature review". Annals of Diagnostic Pathology. 27: 1–6. doi:10.1016/j.anndiagpath.2016.09.002. PMID 28325354. ^ Dojcinov SD, Fend F, Quintanilla-Martinez L (March 2018). "EBV-Positive Lymphoproliferations of B- T- and NK-Cell Derivation in Non-Immunocompromised Hosts". Pathogens (Basel, Switzerland). 7 (1): 28. doi:10.3390/pathogens7010028. PMC 5874754. PMID 29518976. ^ Federico Caligaris-Cappio; Manlio Ferrarini (1997). Human B Cell Populations. Chemical Immunology. 67. Switzerland: S. Karger AG. p. 105. ISBN 978-3-8055-6460-1. Archived from the original on 2016-05-27. ^ a b Kyle RA, Rajkumar SV (2004). "Multiple myeloma". N. Engl. J. Med. 351 (18): 1860–73. doi:10.1056/NEJMra041875. PMC 2265446. PMID 15509819. ^ a b Cifola I, Lionetti M, Pinatel E, Todoerti K, Mangano E, Pietrelli A, Fabris S, Mosca L, Simeon V, Petrucci MT, Morabito F, Offidani M, Di Raimondo F, Falcone A, Caravita T, Battaglia C, De Bellis G, Palumbo A, Musto P, Neri A (2015). "Whole-exome sequencing of primary plasma cell leukemia discloses heterogeneous mutational patterns". Oncotarget. 6 (19): 17543–58. doi:10.18632/oncotarget.4028. PMC 4627327. PMID 26046463. ^ Tricot G (2000). "New insights into role of microenvironment in multiple myeloma". Lancet. 355 (9200): 248–50. doi:10.1016/S0140-6736(00)00019-2. PMID 10675068. ^ Agirre, Xabier; Castellano, Giancarlo; Pascual, Marien; Heath, Simon; Kulis, Marta; Segura, Victor; Bergmann, Anke; Esteve, Anna; Merkel, Angelika (2015-04-01). "Whole-epigenome analysis in multiple myeloma reveals DNA hypermethylation of B cell-specific enhancers". Genome Research. 25 (4): 478–487. doi:10.1101/gr.180240.114. ISSN 1088-9051. PMC 4381520. PMID 25644835. ^ a b Weaver, CJ; Tariman, JD (18 July 2017). "Multiple Myeloma Genomics: A Systematic Review". Seminars in Oncology Nursing. 33 (3): 237–253. doi:10.1016/j.soncn.2017.05.001. PMID 28729121. ^ a b Fernández de Larrea C, Kyle RA, Durie BG, Ludwig H, Usmani S, Vesole DH, Hajek R, San Miguel JF, Sezer O, Sonneveld P, Kumar SK, Mahindra A, Comenzo R, Palumbo A, Mazumber A, Anderson KC, Richardson PG, Badros AZ, Caers J, Cavo M, LeLeu X, Dimopoulos MA, Chim CS, Schots R, Noeul A, Fantl D, Mellqvist UH, Landgren O, Chanan-Khan A, Moreau P, Fonseca R, Merlini G, Lahuerta JJ, Bladé J, Orlowski RZ, Shah JJ (2013). "Plasma cell leukemia: consensus statement on diagnostic requirements, response criteria and treatment recommendations by the International Myeloma Working Group". Leukemia. 27 (4): 780–91. doi:10.1038/leu.2012.336. PMC 4112539. PMID 23288300. ^ Simeon V, Todoerti K, La Rocca F, Caivano A, Trino S, Lionetti M, Agnelli L, De Luca L, Laurenzana I, Neri A, Musto P (2015). "Molecular Classification and Pharmacogenetics of Primary Plasma Cell Leukemia: An Initial Approach toward Precision Medicine". International Journal of Molecular Sciences. 16 (8): 17514–34. doi:10.3390/ijms160817514. PMC 4581206. PMID 26263974. ^ Mitchell, Richard Sheppard; Kumar, Vinay; Abbas, Abul K.; Fausto, Nelson (2007). "Multiple myeloma". Robbins Basic Pathology (8th ed.). Philadelphia: Saunders. p. 455. ISBN 978-1-4160-2973-1. ^ Rajkumar, S. Vincent (2005-01-01). "MGUS and Smoldering Multiple Myeloma: Update on Pathogenesis, Natural History, and Management". ASH Education Program Book. 2005 (1): 340–345. doi:10.1182/asheducation-2005.1.340. ISSN 1520-4391. PMID 16304401. ^ a b c d Rajkumar, S Vincent; Dimopoulos, Meletios A; Palumbo, Antonio; Blade, Joan; Merlini, Giampaolo; Mateos, María-Victoria; Kumar, Shaji; Hillengass, Jens; Kastritis, Efstathios (November 2014). "International Myeloma Working Group updated criteria for the diagnosis of multiple myeloma". The Lancet Oncology. 15 (12): e538–e548. doi:10.1016/s1470-2045(14)70442-5. ISSN 1470-2045. PMID 25439696. ^ "Robbins & Cotran Pathologic Basis of Disease - 9781455726134 | US Elsevier Health Bookshop". www.us.elsevierhealth.com. Retrieved 2016-10-26. ^ Klatt, Edward C. (2011-09-08). Robbins and Cotran Atlas of Pathology. Elsevier Health Sciences. ISBN 978-1455726837. Archived from the original on 2017-09-10. ^ "Mayo Stratification for Myeloma And Risk-adapted Therapy". nebula.wsimg.com. Retrieved 29 September 2017. ^ Sonneveld, P.; Avet-Loiseau, H.; Lonial, S.; Usmani, S.; Siegel, D.; Anderson, K. C.; Chng, W.-J. ; Moreau, P.; Attal, M.; Kyle, R. A.; Caers, J.; Hillengass, J.; San Miguel, J.; Van De Donk, N. W. C. J.; Einsele, H.; Blade, J.; Durie, B. G. M.; Goldschmidt, H.; Mateos, M.-V.; Palumbo, A.; Orlowski, R. (2016). "Treatment of multiple myeloma with high-risk cytogenetics: A consensus of the International Myeloma Working Group". Blood. 127 (24): 2955–2962. doi:10.1182/blood-2016-01-631200. PMC 4920674. PMID 27002115. ^ Angtuaco, Edgardo J. C.; Fassas, Athanasios B. T.; Walker, Ronald; Sethi, Rajesh; Barlogie, Bart (2004). "Multiple Myeloma: Clinical Review and Diagnostic Imaging". Radiology. 231 (1): 11–23. doi:10.1148/radiol.2311020452. ISSN 0033-8419. PMID 14990813. ^ Nishida, Yuki; Kimura, Shinya; Mizobe, Hideaki; Yamamichi, Junta; Kojima, Kensuke; Kawaguchi, Atsushi; Fujisawa, Manabu; Matsue, Kosei (2017). "Automatic digital quantification of bone marrow myeloma volume in appendicular skeletons - clinical implications and prognostic significance". Scientific Reports. 7 (1): 12885. doi:10.1038/s41598-017-13255-w. ISSN 2045-2322. PMC 5635114. PMID 29018236. ^ Kyle RA, Rajkumar SV (January 2009). "Criteria for diagnosis, staging, risk stratification and response assessment of multiple myeloma". Leukemia. 23 (1): 3–9. doi:10.1038/leu.2008.291. PMC 2627786. PMID 18971951. ^ a b c "International Myeloma Working Group (IMWG) Criteria for the Diagnosis of Multiple Myeloma". International Myeloma Working Group. 2015-10-29. Retrieved 2018-08-05. ^ a b Greipp PR, San Miguel J, Durie BG, et al. (2005). "International staging system for multiple myeloma". J. Clin. Oncol. 23 (15): 3412–20. doi:10.1200/JCO.2005.04.242. PMID 15809451. Archived from the original on 2010-08-23. ^ Durie BG, Salmon SE (1975). "A clinical staging system for multiple myeloma. Correlation of measured myeloma cell mass with presenting clinical features, response to treatment, and survival". Cancer. 36 (3): 842–54. doi:10.1002/1097-0142(197509)36:3<842::AID-CNCR2820360303>3.0.CO;2-U. PMID 1182674. ^ Lauby-Secretan, B; Scoccianti, C; Loomis, D; Grosse, Y; Bianchini, F; Straif, K; International Agency for Research on Cancer Handbook Working, Group (25 August 2016). "Body Fatness and Cancer - Viewpoint of the IARC Working Group". The New England Journal of Medicine. 375 (8): 794–798. doi:10.1056/NEJMsr1606602. PMID 27557308. ^ Korde N, Kristinsson SY, Landgren O (2011). "Monoclonal gammopathy of undetermined significance (MGUS) and smoldering multiple myeloma (SMM): novel biological insights and development of early treatment strategies". Blood. 117 (21): 5573–5581. doi:10.1182/blood-2011-01-270140. PMC 3316455. PMID 21441462. ^ Kyle RA, Rajkumar SV (2008). "Multiple myeloma". Blood. 111 (6): 2962–72. doi:10.1182/blood-2007-10-078022. PMC 2265446. PMID 18332230. ^ San Miguel, J.F. ; et al. (2008). "Bortezomib plus Melphalan and Prednisone for Initial Treatment of Multiple Myeloma". N. Engl. J. Med. 359 (9): 906–917. doi:10.1056/NEJMoa0801479. PMID 18753647. ^ Curran M, McKeage K (2009). "Bortezomib: A Review of its Use in Patients with Multiple Myeloma". Drugs. 69 (7): 859–888. doi:10.2165/00003495-200969070-00006. PMID 19441872. Archived from the original on 2011-10-08. ^ Abraham J (2009). "Advances in multiple myeloma treatment: lenalidomide and bortezomib" (PDF). Community Oncology. 6 (2): 53–55. doi:10.1016/S1548-5315(11)70208-X. Archived (PDF) from the original on 2010-10-19. ^ Paul M, Walker F, Bear RA (November 1982). "Plasmapheresis therapy in a patient with multiple myeloma". Can. Med. Assoc. J. 127 (10): 956. PMC 1862296. PMID 7139441. ^ McCarthy, P. L; Holstein, S. A; Petrucci, M. T; Richardson, P. G; Hulin, C; Tosi, P; Bringhen, S; Musto, P; Anderson, K. C; Caillot, D; Gay, F; Moreau, P; Marit, G; Jung, S. H; Yu, Z; Winograd, B; Knight, R. D; Palumbo, A; Attal, M (July 27, 2017). "Lenalidomide Maintenance After Autologous Stem Cell Transplant in Newly Diagnosed Multiple Myeloma: a Meta-Analysis". J Clin Oncol. 35 (29): 3279–3289. doi:10.1200/JCO.2017.72.6679. PMC 5652871. PMID 28742454. ^ Sonneveld, P (July 16, 2012). "Bortezomib induction and maintenance treatment in patients with newly diagnosed multiple myeloma". J Clin Oncol. 30 (24): 2946–55. doi:10.1200/JCO.2011.39.6820. PMID 22802322. ^ "Ninlaro (ixazomib) Capsules, for Oral Use. Full Prescribing Information" (PDF). Millennium Pharmaceuticals, Inc. Archived (PDF) from the original on 19 August 2016. Retrieved 18 August 2016. ^ "Farydak (panobinostat) Capsules, for Oral Use. Full Prescribing Information" (PDF). Novartis Pharmaceuticals Corporation. East Hanover, New Jersey 07936. Archived (PDF) from the original on 22 October 2016. Retrieved 18 August 2016. ^ "Kyprolis (carfilzomib) for Injection, for Intravenous Use. Full Prescribing Information" (PDF). Onyx Pharmaceuticals, Inc. Thousand Oaks, CA 91320-1799 U.S.A. Archived (PDF) from the original on 23 October 2016. Retrieved 20 August 2016. ^ "Empliciti (elotuzumab) for Injection, for Intravenous Use. Full Prescribing Information" (PDF). Bristol-Myers Squibb Company. Princeton, NJ 08543 USA. Archived (PDF) from the original on 8 December 2015. Retrieved 18 August 2016. ^ "Darzalex (daratumumab) Injection, for Intravenous Use. Full Prescribing Information" (PDF). Janssen Biotech, Inc. Horsham, PA 19044. Archived (PDF) from the original on 18 August 2016. Retrieved 18 August 2016. ^ Snowden JA, Ahmedzai S, Ashcroft J, et al. (2010). "Guidelines for Supportive Care in Myeloma" (PDF). British Committee for Standards in Haematology. Archived (PDF) from the original on 2015-09-23. ^ Higginson IJ, Evans CJ (2010). "What is the evidence that palliative care teams improve outcomes for cancer patients and their families?". Cancer J. 16 (5): 423–35. doi:10.1097/PPO.0b013e3181f684e5. PMID 20890138. ^ Lorenz KA, Lynn J, Dy SM, Shugarman LR, Wilkinson A, Mularski RA, et al. (2008). "Evidence for improving palliative care at the end of life: a systematic review". Ann. Intern. Med. 148 (2): 147–59. doi:10.7326/0003-4819-148-2-200801150-00010. PMID 18195339. ^ Child JA, Morgan GJ, Davies FE, et al. (May 2003). "High-dose chemotherapy with hematopoietic stem-cell rescue for multiple myeloma". N. Engl. J. Med. 348 (19): 1875–83. doi:10.1056/NEJMoa022340. PMID 12736280. Lay summary – Medscape. ^ Seiter, K; Shah, D; Chansky, HA; Gellman, H; Grethlein, SJ; Krishnan, K; Rizvi, SS; Schmitz, MA; Talavera, F; Thomas, LM (23 December 2013). Besa, EC (ed.). "Multiple Myeloma Treatment & Management". Medscape Reference. WebMD. Archived from the original on 11 January 2013. Retrieved 2 January 2013. ^ Avet-Loiseau H, Li C, Magrangeas F, et al. (September 2009). "Prognostic significance of copy-number alterations in multiple myeloma". J. Clin. Oncol. 27 (27): 4585–90. doi:10.1200/JCO.2008.20.6136. PMC 2754906. PMID 19687334. ^ Collins CD (2005). "Problems monitoring response in multiple myeloma". Cancer Imaging. 5 (Spec No A): S119–26. doi:10.1102/1470-7330.2005.0033. PMC 1665317. PMID 16361127. ^ "Myeloma statistics". Cancer Research UK. Archived from the original on 28 October 2014. Retrieved 28 October 2014. ^ Ettinger, Stephen J.; Feldman, Edward C. (1 June 2000). Textbook of Veterinary Internal Medicine: Diseases of the Dog and Cat. 1. W.B. Saunders. pp. 516–9. ISBN 978-0-7216-7257-1. ^ a b c Matus, R.E. ; Leifer, C.E. ; MacEwen, E.G. ; Hurvitz, A.I. (1986). "Prognostic factors for multiple myeloma in the dog". J. Am. Vet. Med. Assoc. 188 (11): 1288–92. PMID 3721983. ^ MacEwan, E.G. ; Hurvitz, A.I. (1977). "Diagnosis and Management of Monoclonal Gammopathies". Veterinary Clinics of North America. 7: 119. doi:10.1016/S0091-0279(77)50010-X.